Crystal Pepsi is a clear version of Pepsi Cola which was last available back in 1993. 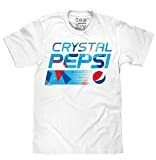 However, Pepsi has rereleased Crystal Pepsi in 2016 due to popular demand from its fans. It has the same caffeine content as regular Pepsi. How Does Crystal Pepsi Compare? 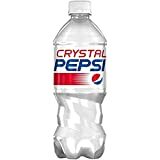 Crystal Pepsi contains 3.15 mgs of caffeine per fluid ounce (10.65mg/100 ml).